This is my submission for the Paper Issues Sketchy Saturday. I was really glad they extended it for an extra week, as I missed it. I had so much fun with the sketch. I took a few liberties with it- like not having journalling at the bottom and I put my title on a banner instead of beneath it, but I think I got most of the components and am really happy with how this layout turned out. 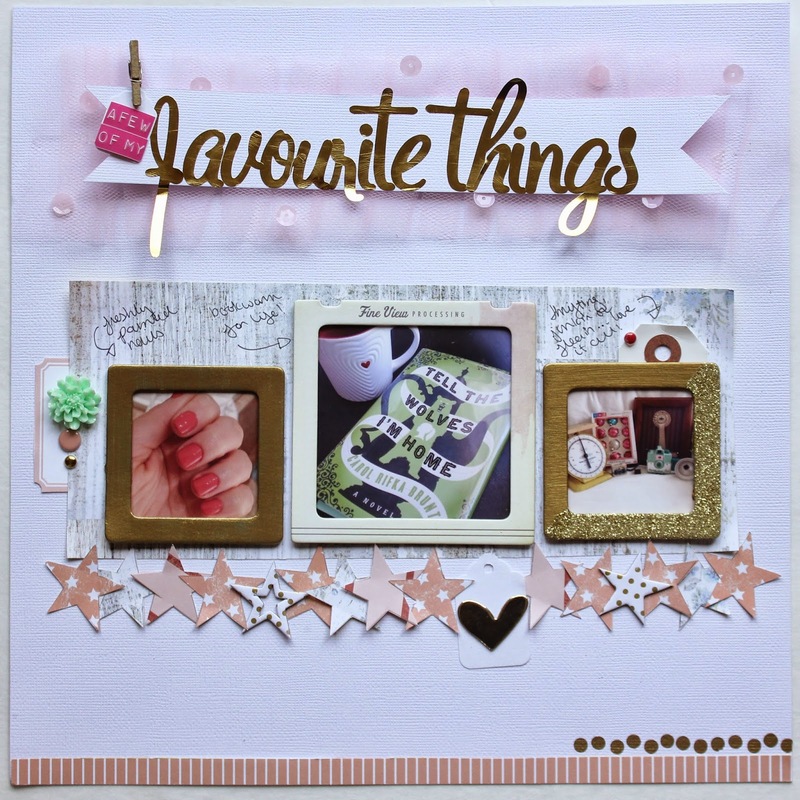 I used Studio Calico's Camelot kit for this layout except for the gold letter stickers and the gold chipboard heart, which are also studio calico. 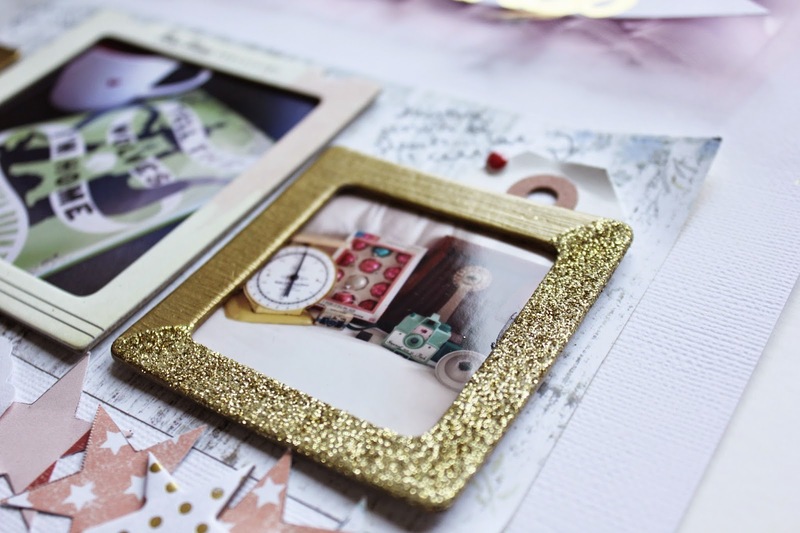 The Crate Paper Frames are also from an older Studio Calico kit from 2013. I also used a few tags and a label from my stash and my trusy Dymo. The title is my favourite part! I used the pink tulle and ruffled it along the top of the page. 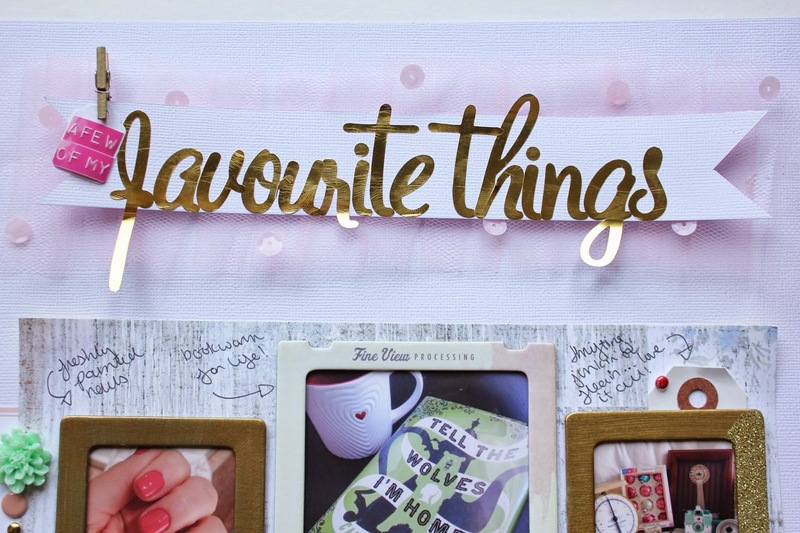 I then cut a banner with white cardstock and used some gold letters stickers for my title. 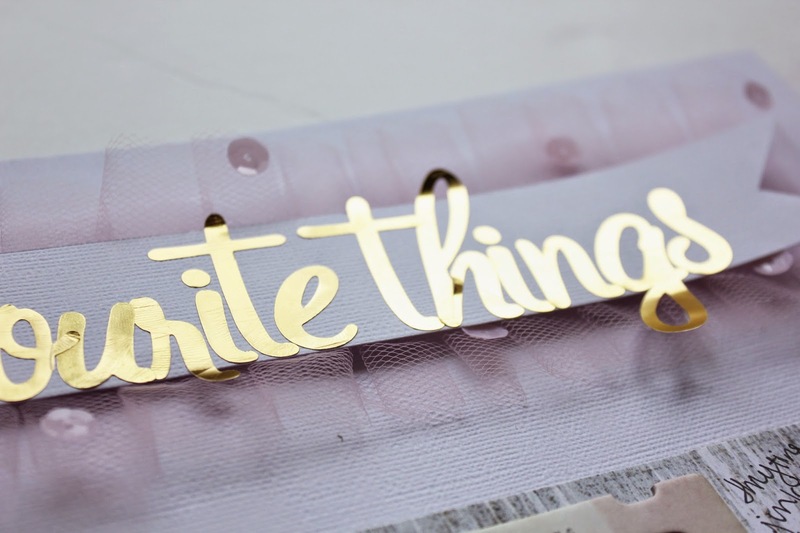 I added a little jewellery tag with some dymo tape for part of the title and attached it with a Studio Calico gold clothes pin. I finished it off with placing a few pink sequins from Studio Calico;s Atlantic line in the layers of the tulle. They perfectly matched the tulle! Instead of just a few starts, I made a banner of starts stretching across my entire page. 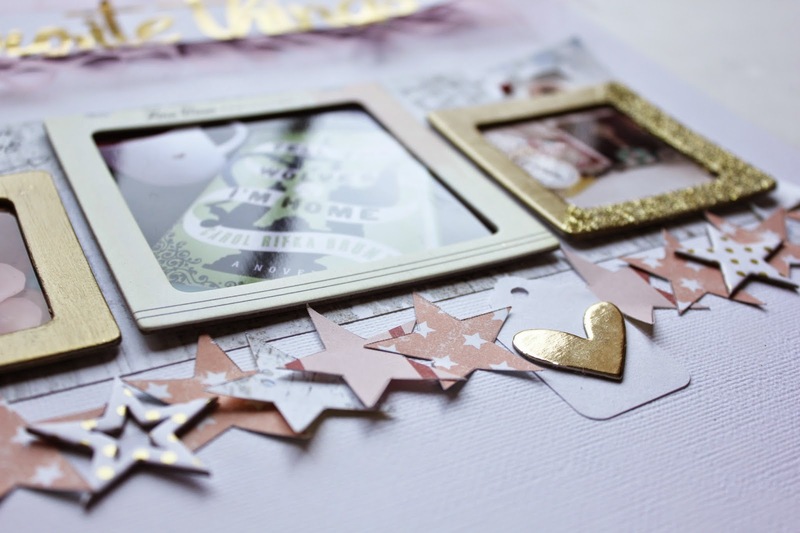 I placed a few gold polka dot chipboard hearts that came in an older Studio Calico kit and a jewellery tag with a gold chipboard heart. If my sewing machine was working, I would definitely have sewn across the banner as I love how that looks. The only chipboard frames I had left were blue, so I painted them with gold acrylic paint. I love the way they turned out. 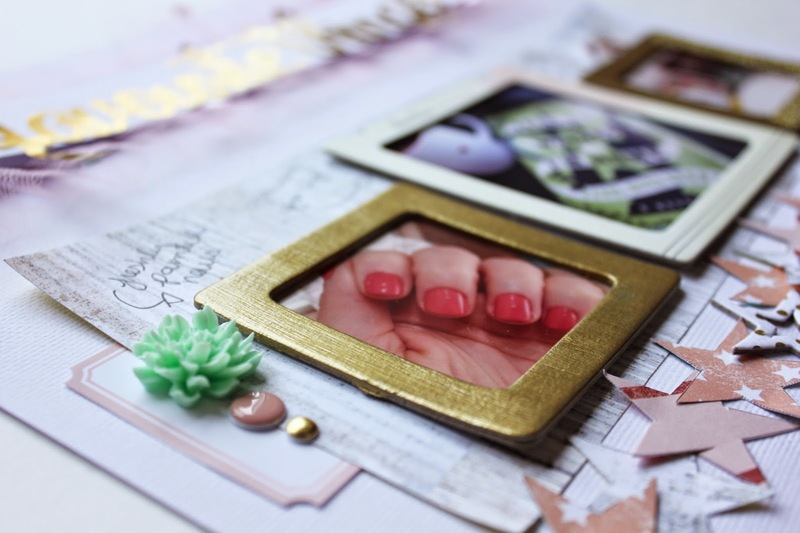 One of the frames I did half in gold embossing powder. I really, really love the way this one turned out. I can't wait for the next Sketchy Saturday. It's so fun to see how everyone interprets the sketch and it's a fun push creatively. Oh my! This is so, so good! Love all the gold accents and how you made the sketch your own.